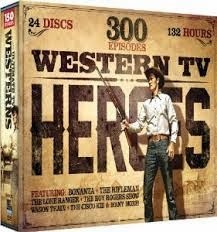 This collection contains 24 discs featuring 300 episodes and 132 hours of Classic TV Westerns! Featuring Cowboy Superstars: Roy Rogers, Johnny Cash, Clayton Moore, Edgar Buchanan, Jack Mahoney, Chuck Connors, Lorne Greene and many more! "Saddle up and prepare to relive your childhood or discover a whole new brand of Hollywood heroes with this 300 Episode collection of family-friendly TV Westerns! Locked and loaded with robberies and holdups, outlaws and showdowns, this rare compilation from the golden age of entertainment represents a large assortment of some of the best Western adventures ever released! Loved by old and young alike, this 24 DVD collection is must for the mavericks in your life!" Holy Moly! If you or someone you know is a fan of westerns or classic TV, this set is sure to bring you many hours of pure entertainment! This set would make a great gift idea or would be ideal for snuggling up on the couch on those crisp autumn afternoons to enjoy:) I wasn't around when any of these shows first aired, so it was my first time watching many of them, but I really enjoyed the set of classic cowboy entertainment! B and the kiddos loved it too. The kiddos can't believe that TV was ever really made in black and white! If you are looking for a great set of TV Westerns, it doesn't get much better than this! ABCD Diaries gives this DVD set from Mill Creek Direct an A+! You can find this set and many more fantastic DVD collections at Mill Creek Entertainment!